What is Hair Gro Therapy? Hair Gro Therapy is a natural and 100% Ayurvedic hair treatment that strengthens the hair roots and follicles. It stimulates the blood circulation and hair growth and visibly works to reduce hair loss, greying and balding. How often do I need to use Hair Gro Therapy? For best results Hair Gro Therapy should be used on alternate days and left overnight. Do I need to add any other product or oil to the serum? No. You do not need to add any other oil or product to the serum. The serum contains all the essential oils that are required for nourishing the hair. Can I use the serum on wet hair? Yes, the serum can be used on wet and dry hair. However, if using on wet hair, please dry off excess water from the hair. Does Hair Gro Therapy work on all types of hair? Yes, Hair Gro Therapy will work on all types of hair. Can I use hair spray and hair gels along with Hair Gro Therapy Serum? It is advisable to use Hair Gro Therapy before, wait for it to settle and then applying your styling products. Can I blow dry my hair after using the serum? Yes, you can blow dry your hair after using the serum at a low temperature setting. Most of our customers start seeing reduction in hair fall and development in 2 to 3 months. Because of the Ayurvedic nature of the product, some people have results over 6 months of usage. The duration of results depends on various factors involving biochemistry, metabolism and health. so we recommend people to try a three month therapy. Are there any side effects of the serum? There are no side effects of the serum as it is 100% natural and herbal. In case of any allergies or any issues, please stop using the product and consult your doctor. The package contains 2 bottles of 100ml Hair Go Therapy Serum. Can you explain the correct method of using the serum? The serum should be used on a clean scalp and evenly spread. You can use it on wet or dry hair, if, however, you are using it on wet hair, dry off the excess water. For best results, leave the serum on until the next time you shampoo. What type of shampoo do I use? We recommend washing your hair with a mild herbal shampoo. Check out few shampoos we recommend from our shop section in the home page. Where can I buy Hair Gro Therapy Serum? You can buy the product from our website or call our customer care number. We don’t retail or whole sale this product at the moment. So avoid buying from any other channels. Is Hair Gro Therapy Serum available to purchase outside India? ]Hair Gro Therapy Serum is available to purchase in India. If you wish to have the product delivered overseas please write to us at support@abzy.com. You can make a payment online by using your credit card, debit card or by Cash on Delivery. Though paying online gives you extra discounts some times. Can I also order other products from this site? How does 3 months or 6 months or 12 months plans work? If you are benefiting from availing subscription plans, then you shall read this. Every month you will get our delivery of Hair Gro Therapy at your doorstep between 05th to 10th. The product is shipped out within two business days of receiving your order and payment. Orders made on weekends or holidays will be processed on the next open business day. You should receive your order within 7 to 10 business days from day of shipping. Its very rare that we miss delivering you within 7 business days. You can please write an email at support@abzy.com along with your order number. we will respond within 1 business day after doing internal checks. You can change the shipping address by contacting us at support@abzy.com or call us on our customer care number within 24 hours of placing your order. Yes. If you call or email us within 3 days of delivery of the product. we offer refunds on transit damages and product leakages. We recommend the customers to go through the ingredients and cross check with their respective doctor before buying the product. Please stop using the product in case you face any allergies. Dihydrotestosterone is a chemical derivative of testosterone and the main reason for hair loss in both men and women. Alopecia Areata is an autoimmune disease that occurs when your immune system mistakenly starts to attack the hair follicles. The hair starts falling in clumps and leaves a round hairless patch on the scalp. In many cases, the hair becomes thin without noticeable patches of baldness. There are a number of factors responsible for hair loss in women. 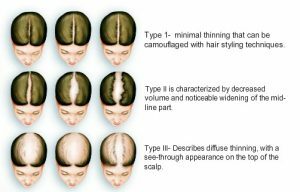 The most common are Female Pattern Hair Loss. Androgenetic Alopecia, or Female Pattern Hair Loss, is a hereditary condition that shortens the lifecycle of hair. Androgenetic Alopecia causes the hair follicles to become smaller, eventually leading to thinner, and light coloured hair. In Female Pattern Hair Loss, the most extensive hair loss happens on the top of the head. During Pregnancy, women’s hairs are much fuller and thicker. It is after giving birth that women suffer from hair loss. It is a common occurrence for hair to fall in large quantity, however, once the women’s body returns to the pre-pregnancy stage, hair growth returns to normal. Though birth control prevents pregnancy, the pills have a lot of side effects. One of the side effects of using birth control is thinning of hair and hair fall. Some women have also reported hair loss after they stop taking the pill. Hair loss with birth control usually happens to women who are sensitive to the hormones that are in the pill and who have a history of hormone-related hair loss. The pill moves the hair from its growing phase into its resting phase faster than usual. Hair loss of this form is called Telogen Effluvium. Birth control related hair loss is temporary and should stop once the body gets used to the pill. You have already noticed by now if you are shedding more hair than usual whether while brushing your hair or when washing your hair. Increased hair loss could be one of the forms of hair loss but to know if you suffer from Female Pattern Hair Loss you need to know the signs. See your family history and see the pattern in which you are losing hair. Does it run in your family? Is it sparse on the top of your head? Check for these following signs. There are several causes of hair loss in women, but the most common of them is Female Pattern Hair Loss or Androgenetic Alopecia (AGA). Age, Hormones, Genetics can change the hair follicles which lead to the condition of AGA. Look back on your family history and see which of your close relatives suffer from balding and hair thinning. Hair loss can be inherited from either parent or both, so if you have hair thinning in your family; you are most likely to get that gene. Hair loss in women mainly occurs on the top of the head and is very visible in the parting area. The parting is the first thing that changes when you have massive hair fall. So if you have started to notice that your parting is widening and you don’t have enough hair to cover it, it’s time to pay attention to it. When does hair loss start in women? Women can start experiencing hair loss from as early as in their 20s, though it is most common when in the 30s and 40s. Is hair loss common in women? Female pattern hair loss is the most common type of hair loss triggered by hormone levels, genetics, and aging. What are the signs of losing hair? There are several signs of hair loss, including: hair with roots on the brush and comb, excessive hair on the pillow, in the shower, and most important a wide parting. What should women do when they notice hair loss? If you are experiencing more than usual hair loss, consult a specialist and see how they can help. When do I qualify as suffering from hair loss? Hair loss begins slowly and subtly, and you will only be able to notice the difference after a few years. But if you pay close attention you can catch it in its early stages. You can check the top of your head and the parting where the hair fall pattern mostly occurs. Does hair loss happen due to exposure to sun? Exposure to Sun does not cause hair loss, but it is advised to cover your hair when going out. Do changes in lifestyle affect the hair? Hair loss in women can happen if there are hormonal changes, diet changes, during and after pregnancy, too much stress, medical conditions like cancer, menopause, and medication like birth control. How should you go about speaking to a healthcare professional? You are now aware that you suffer from excessive hair loss and it is stressing you out, it is time to go to a specialist. But the question is how and where to start. Following are some things that you could do. Over a course of one to two months track, how much hair are you losing and in what quantity? Make a note of when are you losing hair the most, is it while showering or brushing your hair. Discuss this with your hair specialist. Bring together all the evidence you can to your specialist. It will make it easier for them to test your hair and accordingly recommend the treatment you need. Make a note of all the tests and treatments you have done and the results you have achieved. Note all the ingredients in each test. Take some pictures of your scalp to your specialist and if you are not shy take some fallen strands along. There are plenty of causes for hair loss in women, not just genetics. Your lifestyle is equally responsible for hair loss. Whether you are stressed, going through some trauma or shock, medical condition all lead to hair loss. Do inform your specialist in detail and also the medicines you are taking if any, including birth control. Your hair specialist will ask more questions regarding your medical history as well as your family’s. So go prepared with all the details. Ask if further tests are required and the procedure. When you are losing hair you need to understand why it happens. Hair loss is very common in men. Most men around the age of 35 start experiencing hair loss. Most of the times it is hereditary and can come from either side of the family. Stress can cause hair loss but that is only temporary. Male Pattern Baldness is the most common form of hair loss in men. Also known as Androgenetic Alopecia, it is believed to be a combination of the male hormone dihydrotestosterone and genetics. It pattern begins from the temples and vertex of the scalp and the hairline progressively recedes backwards. Am I losing hair because it is hereditary? Unless you are going through an extremely stressful phase in your life, if you are noticing more than usual hair fall, then you are experiencing the early signs of male baldness. You will start to notice a receding hairline and hair loss from the crown. If you have other family members with receding hairlines and it matches with your receding hairline, there is a high possibility that you have inherited the hair loss gene. What is the cause of hair loss in men? The most common factor of hair loss in men is Androgenetic Alopecia (AGA). Age, genes, hormones all play a part in this hair loss condition. In AGA, the hair follicles shrinks and every growth cycles produces shorter, smaller, finer and less visible hair. Over a period of the follicles are destroyed and stop producing hair. If you are not sure that you are suffering from extreme hair loss, look for these signs: More hair in the drain, Scalp burn in the sun, more strands on hairbrush or comb, more hair on the pillow. What are the other possible conditions of hair loss in men? Male Pattern Baldness is the most common cause of hair loss in men. There are other reasons responsible for hair loss mentioned below. Alopecia Areata – Alopecia Areata is characterized by sudden bald patches. In some extreme cases, it can lead to complete hair loss. The condition can appear anywhere on the head and is often circular. Alopecia Totalis – Alopecia Totalis is an autoimmune condition that turns the immune system against the hair follicles. It results in total hair loss on the scalp and can also affect eyelashes and eyebrows. Telogen Effluvium – In this condition hair loss is caused if you are under severe stress or shock. It leads to hair thinning and patches of thin hair. Hair starts to grow again once the shock and stress are controlled. Tight Hairstyles – Tight ponytails, man buns, the combed back look, dreadlocks, and other styles can all cause stress to the hair making it weak overtime resulting in hair loss. Thyroid – The long-term symptom of suffering from Thyroid problems is hair loss. When the thyroid is underactive, it can lead to some medical conditions. Infections – Ringworm is one of the infections associated with hair loss. Ringworm is a fungus that grows on the scalp and other body parts. It forces the hair to fall in patches. Other infections include Dermatitis, which is mainly a skin condition, Folliculitis, which cause inflammation of the hair follicles and Syphilis, which is a sexually transmitted disease that can cause hair to thin and turn brittle. Diet – Poor diet can lead to unhealthy hair and poor hair quality. Hair is made of protein; if there is no protein in your diet, it can affect the hair growth. Smoking – Smoking can cause hair loss. Cigarette smoke contains toxins that cause damage to the hair follicle DNA. The smoke leads to follicular micro-inflammation and fibrosis and impaired blood flow. This disrupts the normal growth cycle and in turn, results in hair thinning and loss. Drugs and Medication – Most medications have side effects of one form or the other, and one of them is hair loss. Anti-depressants, Excessive Vitamin A, medicines for blood thinning, steroids, hormonal medications like testosterone can all lead to hair loss and hair thinning.